I have two main passions, automotive design and martial arts. My passion for design has led me to having a 1st class degree in Automotive design from Coventry University and I am currently a clay modeller in Germany. I started traditional Japanese Jujitsu at the age of 9 and carried on this passion ever since. At the age of 18 I achieved my 1st Dan (black belt) before leaving my home town for university. At this point I decided one martial art wasn't enough and started Kung Fu/Wing Chun, in which I have achieved purple sash. For many years I have actually assisted in teaching lessons and, in fact, taught in seminars. 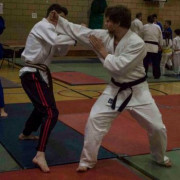 I have also taken part in Karate and Thai Chi and other martial arts.